I'm sure everybody knows about the monkey boy with a punch bigger than his head. 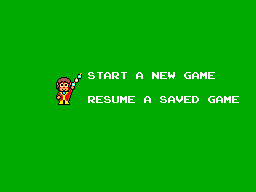 Yes, Alex Kidd. Sega's mascot until one particular colorful rodent kicked him out of his place. 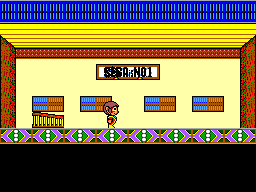 No matter what generation of consoles are we playing, the true Sega fans can never forget the fun but also frustrating hours we spent along with the monkey boy. You probably wondering why the hell do Alex's buddies are dressed in Kimonos. Well, it is kind of hard to explain. This game was released in Japan with the title : Anmitsu Hime, which means Sugar Princess... or something. Originally a manga about a tomboy princess in ancient Japan, Anmitsu Hime was later released as an anime and became quite popular, so much that Sega released a game in Japanese SMS. For some reason, the guys at the US and EU branches of the Sega decided to release this game to english speaking countries. (Possibly because there were almost no game to release thanks to a you-know-who, backstabbing gaming company) But since nobody in US or Europe did not know a jack about the Anmitsu Hime, they localized the game with the monkey-boy whose popularity was rapidly waning. Well there you have it... a short, weird gaming experience for possibly elementary school Sega fans. Here's the "story": There is a new arcade opening in the city called "High-Tech World" and Alex is raring to go. The problem is, his moronic friend torn the map showing the path to the city to 7 different pieces and Alex must piece the map together and reach the arcade before 5:00pm, when it is going to be closed. You will wander around the castle, looking for clues and friends that might help you in your search. Thing will not be easy however, as many traps are awaiting you, even inside you own castle. Falling from the broken staircase, getting caught by you mother, eating too much hamburger (don't ask) etc. etc. IF you manage to get through all the nosense in the castle and complete the map, you must now venture through a forest infested with funny looking ninjas. If you can pass this "action packed level" too, Alex can finally get to the arcade and we can finally sit back and think about, why this game ever created at the first place. Just what you might expect from a 1989 SMS game. Nothing to spectacular but not too shabby either. At least you can see the faces of the characters more detailed from most games. Then again this game barely last more than 45 minutes so, what's the point of talking about the graphics, right? Cute... A little too cute perhaps. Compared to much better musical scores of other SMS games, this game's music will sound like a chorus of an elementary school band... But, you know what? Maybe that was their point after all... Sound effects?... Oh please. Controls...? Well, aside from walking around the castle and jumping and throwing "yellow things" to the ninjas (I'm pretty sure they are not Shurikens. If they were, Joe Musashi would commit harakiri after seeing them.) you will not have much problem. Oh and, sorry for saying this but if you can't pass the arcade section of this game, you might as well quit playing games altogether. Heheheheh... Replay value...? Aside from the fact that dying over and over because of the silly traps laying in the castle, there is no reason for you to play this game after you are done. I'm not sure really. Sega wouldn't just create a game to make advertisement of their arcade consoles now can they? Beacuse I see no reason for them to release this game in english. I'm sure it makes sense in Japan with a game of a manga and all but here...? It was nice seeing the Monkey Boy again but not like this. 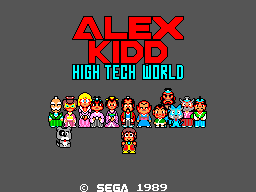 If you want to see a better Alex Kidd game, you can always play Miracle World or Shinobi World. One last note: Sega is NO1. We all know that Alex, really.